Will Age Become An Issue In Dianne Feinstein's Re-Election Campaign? Ranking member Sen. Dianne Feinstein, D-Calif., arrives for a Judiciary Committee hearing on Capitol Hill in December. Critics have raised questions about her age as she runs for re-election. It can be a delicate matter to bring up someone's age. But in California, Sen. Dianne Feinstein's age has become a openly discussed issue in her campaign for a fifth full term. Feinstein — a Democrat — is 84, making her the oldest member of the United States Senate. But not by much. There are seven other senators who are also in their 80s, though none of them are running for re-election this year. Some political columnists have said that Feinstein shouldn't run again. Harold Meyerson, executive editor of the liberal magazine The American Prospect, made that argument in a column in the Los Angeles Times. "This is a six-year term," Meyerson says, "which is the longest term any elected officials in the United States can be elected to. So the issue isn't simply what shape is Dianne Feinstein in at age 84, it's also what shape will she — or anyone — be in at 91?" There's no way to predict that, says Jennifer Ailshire, a professor of Gerontology and Population Health at the University of Southern California. People age differently from one individual to the next, she says. "Some older adults are quite frail, while others are incredibly robust." And their chronological age doesn't really tell you much. "Rather than focus on someone's age, we should be focusing on their biological age, which is the age of their cells, tissues and organs," Ailshire says. That's not the sort of information that voters have access to. What they do know about Feinstein is that she received a pacemaker last year, but only missed a single day of work. That work includes serving as the top Democrat on the Judiciary Committee, as well as having senior status on Appropriations and the Senate Select Committee on Intelligence. Throughout her career, Californians have known Feinstein as a cautious, middle-of-the road politician. That served her well when she was first elected to the Senate in 1992. The California electorate was also more moderate then. But Harold Meyerson says, California leans more to the left these days. "So in many ways, I think, she still positions herself to the right of certainly where California Democrats are, and in many ways, of where California is." But it's never been Feinstein's way to be a liberal flame-thrower. Instead, as she told an audience in San Francisco last year, what's important is knowing how to get things done. "You've got to be able to compromise," she said. "And compromise, ladies and gentlemen, isn't a dirty word. Compromise is what moves this government forward." Feinstein has a major primary challenger from her left. He's Kevin de Leon, 51, leader of the California State Senate. And since California has a nonpartisan, top-two primary, he's likely to be her opponent in November as well. De Leon has blasted Feinstein for being too conciliatory towards President Trump and too slow to stand up for young people on DACA, the program for some undocumented immigrants who were brought to this country as children. For the record, Feinstein voted against the January budget resolution to re-open the government because it lacked an extension for DACA. De Leon's campaign declined to be interviewed for a story on Feinstein's age. He's been endorsed by the progressive political action committee, Democracy for America, which claims around 300,000 members in California. Communications Director Neil Sroka says what his organization wanted to know was, "Who's going to be best equipped to lead the resistance to Donald Trump and set a path forward for what an inclusive, populist vision for this country looks like?" And for his organization, that wasn't Feinstein. Her age isn't a problem, but her long tenure in the Senate is. "We're going to need more [progressive] candidates moving up the ranks," Sroka says. "We can't do that if the same old people are running for the same old offices over and over again." Feinstein is hardly the first candidate whose age has become an issue. But few have been damaged by it. In 1984, President Reagan famously teased his younger opponent, Minnesota Sen. Walter Mondale, that he would not criticize him for his youth and inexperience. And just two years ago, when Arizona Sen. John McCain's primary opponent said he was too old to be running for re-election at the age of 80, her comments were called desperate, nasty and sick by the media; she lost decisively. But Dianne Feinstein may be more vulnerable. While polls show her ahead by double digits, one survey showed her support dropping several points when voters were told her age. Bill Carrick, Feinstein's longtime political strategist, says there have been older politicians going back decades "and I never heard all this racket." Then again, he notes, they were all men. "We now are getting to the point where there are senior senators who are female," which suggests, says Carrick, that the concerns expressed about Feinstein's age represent "quite a double standard." Gerontologist Jennifer Ailshire says that if there's going to be a double standard, the science says it should be the other way round. "Women have a survival advantage over men," she says. "Scientists have found that men have higher epigenetic aging rates, meaning their cells and tissues are older, even when they're the same chronological age [as] women." Whether age should be an election issue will ultimately be settled by the voters. But those voters themselves are also aging. A dozen years from now, one-fifth of the U.S. population will be 65 years old or more. Some Californians have raised a delicate political question. What age makes you too old to hold a demanding and important job? Her critics have aimed that question at Senator Dianne Feinstein. At age 84, she is the oldest member of the Senate. She is also a deeply influential Democrat, and she is running for another term. NPR's Ina Jaffe reports. INA JAFFE, BYLINE: Dianne Feinstein may be the oldest member of the Senate, but not by much. There are seven more senators who are also in their 80s. None of them, however, is running for re-election this year. And some political columnists have said that at age 84, Feinstein shouldn't be. Harold Meyerson, executive editor of the liberal magazine The American Prospect, made that argument in a column in The Los Angeles Times. HAROLD MEYERSON: This is a six-year term which is the longest term any elected officials in the United States can be elected to. So the issue isn't simply what shape is Dianne Feinstein in at age 84, it's also what shape will she or anyone be in at age 91? JAFFE: And there's no way to predict. Jennifer Ailshire, an assistant professor of gerontology at the University of Southern California, says people age really differently from one individual to the next, and their number of years doesn't always tell you much. JENNIFER AILSHIRE: Rather than focus on someone's age, we should be focusing on their biological age, which is the age of their cells, tissues and organs. JAFFE: And that's not the sort of information that voters have access to. What they do know about Feinstein is that she received a pacemaker last year but only missed a single day of work. That work includes serving as a top Democrat on the Judiciary and Appropriations Committees, as well as the Senate Select Committee on Intelligence. Throughout her career, she's been a cautious, middle-of-the-road politician. That served her well when she was first elected to the Senate in 1992 and the California electorate was also more moderate. But Harold Meyerson says California leans more to the left these days. MEYERSON: So in many ways, I think she still positions herself to the right of certainly where California Democrats are and, in many ways, of where California is. 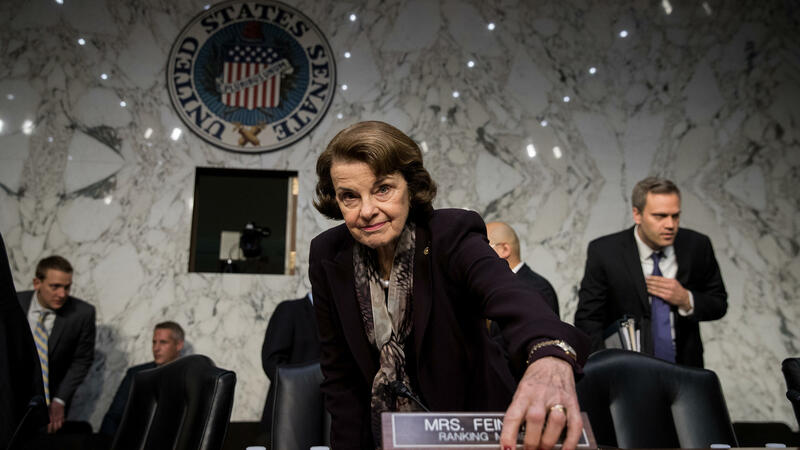 JAFFE: But it's never been Feinstein's way to be a liberal flame thrower. Instead, she reminded an audience in San Francisco last year that what's important is knowing how to get things done. DIANNE FEINSTEIN: You've got to be able to compromise. And compromise, ladies and gentlemen, isn't a dirty word. Compromise is what moves this government forward. JAFFE: Feinstein's major primary challenger is 33 years her junior and coming from her left. KEVIN DE LEON: I'm the youngest child of a single, immigrant mother. JAFFE: That's Kevin de Leon, the leader of the California State Senate in a campaign video. A campaign spokesman said they wouldn't comment for a story that focused on Feinstein's age. Leon's been endorsed by the progressive political action committee Democracy for America, which claims around 300,000 members in California. Neil Sroka is the communications director. He says it's a problem when politicians serve term after term as Feinstein has because it prevents a new generation of leaders from moving up. NEIL SROKA: And we can't do that if the same old people are running for the same old offices over and over again. JAFFE: Raising a candidate's age as a campaign issue has rarely inflicted much damage. In 1984, President Ronald Reagan made a joke of it. And two years ago, when Senator John McCain's primary opponent said he was too old, the media called her desperate. But Feinstein may be more vulnerable. While polls show her ahead by double digits, one survey showed her support dropping several points when voters were told how old she was. Bill Carrick is Feinstein's longtime political strategist. He says there have always been older politicians. Then again, they were all men. BILL CARRICK: We now are getting to the point where if there's senior senators who are female, there seems to be quite a double standard. JAFFE: Gerontologist Jennifer Ailshire says if there is going to be a double standard, the sign says it should be the other way around. AILSHIRE: Because women have a survival advantage over men. Scientists have found that men have higher epigenetic aging rates, meaning their cells and tissues are older even when they're the same chronological age than women. JAFFE: Whether age should be an election issue will ultimately be settled by an electorate that is also aging a dozen years from now. One fifth of the U.S. population will be 65 years old or more. Ina Jaffe, NPR News. Transcript provided by NPR, Copyright NPR.